The Cooper's Hawk is a crow-sized woodland raptor that specializes in eating birds. It is built for fast flight through an obstacle course of trees and limbs and is adept at catching birds in flight, including birds at birdfeeders. A recent radio-tracking study in southwest Tennessee found that during the non-breeding season, forest habitats were used most for foraging, edge habitats second, and open fields third, even though fields were just as available as forests. The Cooper's Hawk breeds across most of the United States, southern Canada, and northern Mexico, and winters throughout the United States and Mexico. It is most readily observed during fall migration at "hawkwatch" sites where raptors concentrate. Description: Male and female Cooper's Hawks have similar plumage, but the female is about one third larger than the male. Adults are gray above with a darker contrasting cap on the head, the underparts are barred reddish-brown, the tail is long, rounded, and barred, and the wings are rounded. During the first year, Cooper's Hawks are brown above, with brown streaking on the white underparts. Adult eyes are red; first year bird's eyes are yellow. In flight, the wingbeat is stiff, and the head appears large. Weight: 0.5 to 1.3 lbs. 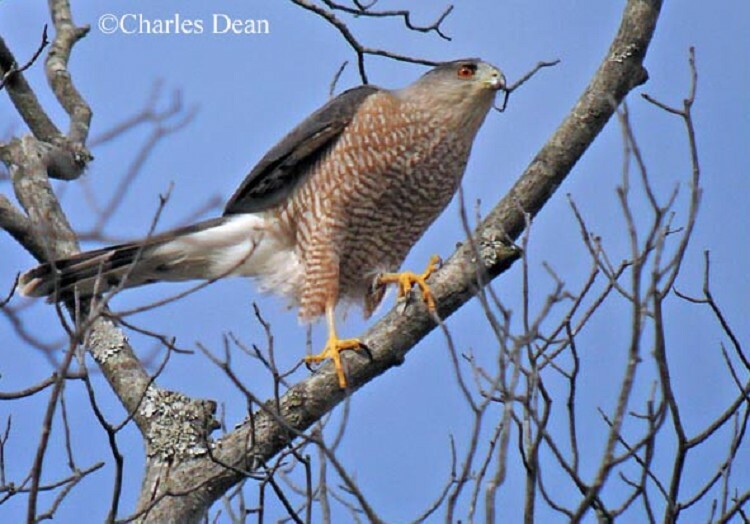 Habitat: In Tennessee, Cooper's Hawks tend to nest near the edge of large patches of deciduous, mixed, and coniferous forests, rural woodlots, and wooded suburban areas. Diet: Mostly eats medium-sized birds such as doves, pigeons, jays, and robins. Nesting and reproduction: This is a secretive and inconspicuous species during the breeding season. Clutch Size: 4 to 5 eggs, occasionally 3 to 7. Incubation: The female incubates the eggs for 32 to 36 days, while the male brings her food. Fledging: Both parents feed the nestlings. They start to climb about the nest at 4 weeks of age, and begin to make short flights soon after. The parents continue to feed the young for up to 7 weeks. Nest: The nest is an open bowl of sticks lined with bark and placed in the main crotch, or against the trunk, of a live tree. Often placed on top of old crow, squirrel, or other hawk nests. The same nest is often used in subsequent years. Nest heights range from 10' to 60' above the ground. 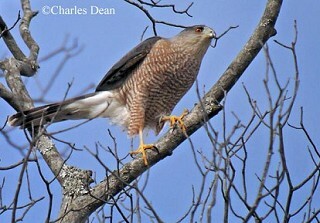 Status in Tennessee: The Cooper's Hawk is an uncommon permanent resident, breeding mainly in Middle and East Tennessee. It is most common during fall migration, from September to October, especially along the eastern mountains. In winter, more northerly nesting birds join Tennessee's resident population. Numbers of Cooper's Hawks appear to be stable or possibly increasing. Cooper's Hawks fly at high speed through vegetation to catch their prey. A recent study found that 23% of all Cooper's Hawks examined had healed fractures in the bones of the chest, especially of the furcula (wishbone). They will also chase prey on foot through thickets. Unlike falcons that use their bills, Cooper's Hawks squeeze their prey to death with their feet, and have been known to drown prey by holding them underwater. Female Sharp-shinned and Cooper's Hawks are more than 30% larger than males, and show some of the greatest reversed size dimorphism of any of the world's hawks. Large numbers of Cooper's Hawks can be seen on migration, especially at hawk watches such as Hawk Mountain, Pennsylvania; Cape May, New Jersey. Fall migration generally begins in late August and continues through early November.